A Unique and Revealing Look at America! The Miracle and Magnificence of America. If you enjoy this site, please consider purchasing my recent book (as low as $9.99). Click here to get it at Amazon. See here for more information. The Miracle and Magnificence of America and "Like" it. Thank you!!! Hillary "Needs to be Indicted" & "In Jail"
The Rainbow Mafia and Their "Heterophobic Gender Deniers"
For the most part, the articles/columns linked below appear in chronological order, beginning with the earliest. New Film: Is Genesis History? IF YOU ENJOY THIS SITE, PLEASE CONSIDER PURCHASING MY BOOK. 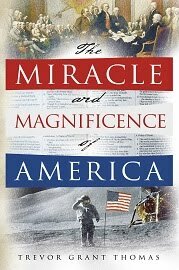 The Miracle and Magnificence of America reveals how, from the time of Columbus until the modern era, the Hand, the Word, the Wisdom, and the Blessings of God worked in the lives of individuals, events, and institutions to shape the United States of America into the greatest nation the world has ever known. If you enjoy this site, please consider purchasing our book. It is a great gift for young couples! In Debt-Free Living in a Debt-Filled World, Trevor and Michelle will tell you candidly how they paid off their debt, built their home without a mortgage, and have lived debt free since 1999, raising four children on a teacher's salary. I was born in 1969 to Edsel and Carolyn Thomas and have lived all of my life in Northeast Georgia. I've been a follower of Jesus since 1986. I'm originally from White County where I graduated from high school and lived for the first 20+ years of my life. Michelle and I married on Jan. 31, 1998. We have four beautiful children (3 boys and one girl): Caleb, Jesse, Caroline, and Noah. I have a BS degree in physics and an MEd in mathematics education from the University of North Georgia. I have an EdS in mathematics education from the University of Georgia. I've taught mathematics since 1993. In 2013, Michelle and I published Debt-Free Living in a Debt-Filled World. In 2016 I published The Miracle and Magnificence of America. I have been writing opinion columns since 2001. My website has existed since 2007, though in its current format since 2014. My hobbies include anything that allows me to spend time with my family, and includes movies, swimming, hunting, fishing, gardening, and maintaining my lawn. I also enjoy most sports that involve a ball, and try hard not to cuss while watching the Georgia Bulldogs, Atlanta Falcons, Braves, and Hawks, and the Dallas Cowboys.